This week we are thrilled to welcome New York-based artist Dana Levy! We have chosen to show an interview with Levy that was published by BOMB Magazine. In this insightful interview, Levy sits down with New York curator and critic Naomi Lev where they discuss Levy’s practice in great depth. Disengagement, 2005, still from single-channel vertical video. NL Let’s go back some more, to 2008, to Silent Among Us. Tell us about the video and why you chose that title. 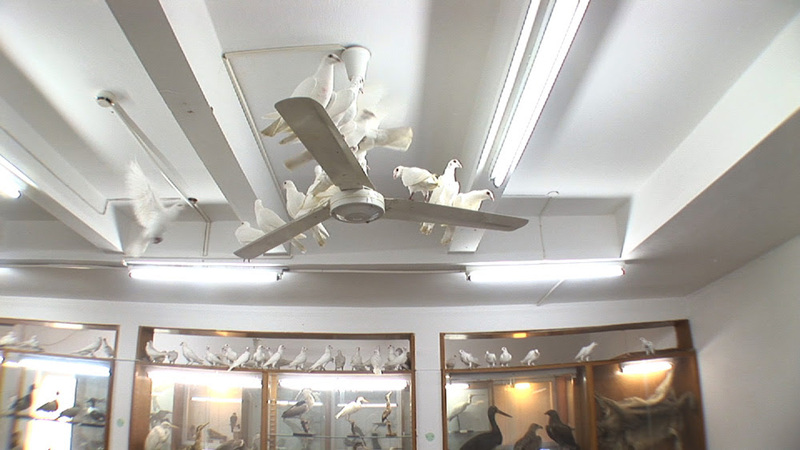 DL I brought one hundred live doves to fly around Beit Sturman Natural History Museum in Israel, which has a lot of taxidermy birds. I called it Silent Among Usbecause for me it was about how death, and history is very present in daily life in Israel. Death, as well as history, and the Bible are the foundation, or the excuse, for the country’s existence. The title Silent Among Us pays homage to this silent presence. NL How did you bring the doves into the museum? Silent Among Us, 2008, still from single-channel video. DL This was another weird project because I got the idea after going to La Specola Museum in Florence. I love natural history museums, especially when they are old and run down. I kept thinking I would love to bring live animals there because at the time I was photographing a lot of empty and abandoned houses for a series of works called Habitat (2008). I really wanted to introduce life into them, but, then again, I never thought any museum would allow me to do that. But I learned over the years that, if you have an idea, you can make it happen. Things can easily fall into place, if you do not give up. Then I heard that curator Yuval Kedar was organizing an exhibition in a natural history museum, a small one in the north of Israel. I immediately told him about my idea, and he helped me make it happen as a part of the show. The head of Kibbutz Ein Harod, where the museum is located, was the one who said that he liked this idea, so we did it! Dead World Order, 2012, still from single-channel video. After this work I created the video The Wake, 2011. I really wanted to do something similar with butterflies. I wanted to bring butterflies into the entomology department and bring them to life. I searched online for images of museums with butterfly collections. Finally I found the Invertebrate Zoology department of the Carnegie Natural History Museum in Pittsburg. I called the entomologist Dr. John Rawlins and told him I wanted to bring a hundred live butterflies into the department. He is a quite opened minded and eccentric, and he asked me: “Why do you want to do that?” I replied, “Why do poets write poems?” He liked that answer, so he let me realize my vision.